Chapter 1: (10:26) Open D to Open G Note: Please work through the lessons in Hawkeye's series in sequential order. He frequently expands upon concepts discussed in previous lessons. If you skip around through the lessons, you may miss a key piece of information. At this point in the series, you have learned several important transposition concepts. You have learned how movable scale patterns and chord voicings can be moved to various locations on the fretboard in order to play in different keys. Hawkeye has explained how a capo can be used to change the key of a song. You've also learned that material in open D can be played in open G by moving everything up a string (towards the floor). In lesson 47, Hawkeye demonstrated how to play the Rolling Stones song "No Expectations" in open D tuning. In the current lesson, he uses this song as an example of how to transpose a song from open D to open G.
Note: This song does not follow the 12 bar blues format. However, it sounds very "bluesy" since it is played with a slide in an open tuning. In open D tuning, this song features the following chords: open D, D barre at 12th fret, C barre at 10th fret, and G at the 5th fret. In open G, the same chord voicings and fretboard locations are used. However, different chords are now produced due to the tuning. The open chord and barre chord played at the fifth fret is a G major chord. The fifth fret barre chord is a C chord. The barre chord at the 10th fret is an F major chord. The song utilizes the I, IV, and bVII chords regardless of which key it is played in. These three chords are the primary triads of the Mixolydian tonality. For more information about this mode, please refer to the JamPlay Scale Library. This section can be accessed through the "Teaching Tools" button on the left side of the homepage. Note: A transcription to Hawkeye's version of the song in open G tuning can be found under the "Supplemental Content" tab along with the original lyrics to the song. Remember to use the slide whenever possible when playing the chord progression to the song. Slide into the F and C barre chords. You can also substitute the G barre chord at the 12th fret for the "open" G major chord. This will allow you to slide into the chord since it is a fretted barre chord. Watch and listen as Hawkeye demonstrates the song at 04:45. Check out the original recording of the song and compare / contrast the differences between their version and Hawkeye's if you haven't already done so. The Stones play the song at a slower tempo. This allows Keith Richards to really long, dramatic glissandos into each chord. This is especially effective on electric guitar since the slide sustains better. Also, check out other covers of the song such as Johnny Cash's version from Gone Girl. Thanks for this lesson from me too Hawkeye. I hope the next batch of lessons appears soon - I can go back and revise some of the lessons but I like this journey a lot and I want to keep going. The Stones can still do the blues - A Bigger Bang (2005 I think and their 25th album) has "Back of My Hand" which was for me the highlight of the album and sounded very blues roots to me. Also sounded very open G and I think Keith Richard does a lot in open G but with no 6th string on his Tele. 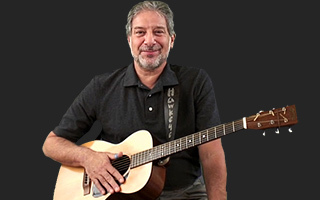 Combine open G chord on the top 5 strings and the (top to bottom) open, first fret, open, second fret, open chord and hit the right rhythmn and hello it's Keef playing your guitar. You are an artist at teaching. I am 60 years old and havent played much since Viet-Nam. I really want to learn to play well. I live in Jackson, Mississippi where Blues is no stranger. Thanks a bunch. realestateexchange, Thanks so much for your kind message. Very much appreciated. I've been through Jackson, MS many times on my way from Memphis to the Gulf Coast ... but I've never performed there. The closest I've gotten to performing in Jackson is at the King Biscuit Fest in W. Helena, AR (now called the Arkansas Heritage Fest). Yes, JAckson is a blues town, and home to the old blues label Trumpet Records (Sonny Boy Williamson and other old blues greats), and Jackson is home to the modern blues label, Malaco Records (which I'm sure you're aware of). Again, thanks for the kind words and for your enthusiasm. I hope you continue to enjoy these lessons. curranni, The Rolling Stones were originally a blues band ... look at the songs on their first 2 or 3 albums ... almost all blues songs by Muddy Waters/Howlin' Wolf/Willie Dixon, etc. It well known that he name the "Rolling Stones" was taken from the Muddy Water song Rolling Stone. Brian Jones was the main force in originally creating the Stones sound and their choice of music ... he was a huge blues fan and player ... when Brian Jones died, early on in the Stones career, that influence of his passed ... and the direction of their music change toward more original rock songs ... it was the Stones who pretty much 'introduced' white kids in the USA to blues music. When the Stones first visited the USA on tour, at a press conference they were asked what great sites in the US they were looking forward to visiting ... Empire State Building? Golden Gate Bridge? Statue of Liberty? Mick Jagger's response was, "We want to go to Chicago to see Chess Records and meet Muddy Waters." The press (white) did not have a clue what Mick was talking about. The Stones did just that ... they visited Chess Records in Chicago and met Muddy Waters ... and did some recording in the studio, as well. The Rolling Stones got their name from a blues song ... and were a blues band and heavily influenced by blues ... even today. I have been playing open tunings for a while now, but it`s always good to learn a new song. Thanks. brian777, Thanks. Glad you're playing a 'new' song ... if you want to grow/learn, you have to keep challenging yourself. I hope you continue to enjoy these lessons. DHARAMCHAND, YOu're most welcome. Thanks so much for your kind comment. I hope you continue to enjoy these lessons ... and perhaps teach us all some blues 'ragas' on the slide guitar ... slide guitar can be played in a similar fashion as the sitar ;-) ... blues sitar ... or raga blues ... it's universal ! ... Namaste. harryj, Thanks for the comment and for enjoying these lessons.